UPDATE Sunday morning: Bishop Strickland of Tyler Texas responds to the letter below. 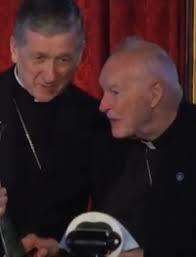 A courageous Bishop… I hope other bishops follow his lead (write your bishop to do the same). UPDATE COMMENT Sunday Evening: This continues to grow and amaze. It is almost surreal. I think the dam has burst and the bubble has popped. Heads will roll. The Lavender Mafia – the homosexual conspiracy in the hierarchy – is about to come crashing down. 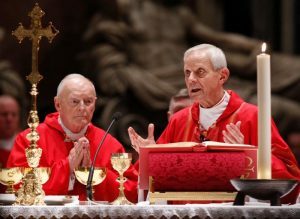 Long live the Church which will survive every scandal and conspiracy! I still love being Catholic and consider myself blessed to be a Catholic now, in this age, to see this revolution of change and reformation. This letter of Archbishop Viganò could go down as one of the great documents in Church history. 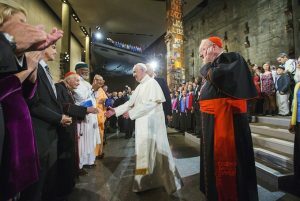 In a written testimony, Archbishop Carlo Maria Viganò (picture to the right) claims Pope Francis withdrew sanctions against Archbishop Theodore McCarrick. 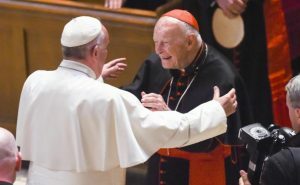 Archbishop Viganò, who said his “conscience dictates” that the truth be known as “the corruption has reached the very top of the Church’s hierarchy,” ended his testimony by calling on Pope Francis and all of those implicated in the cover-up of Archbishop McCarrick’s abuse to resign. 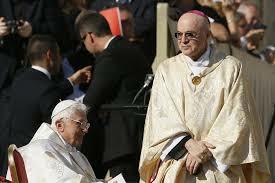 “…Francis is abdicating the mandate which Christ gave to Peter to confirm the brethren. Indeed, by his action he has divided them, led them into error, and encouraged the wolves to continue to tear apart the sheep of Christ’s flock. For Pentin’s whole article in National Catholic Register, click here. To read Archbishop Viganò s 11-page letter, click here. Thank You for getting out the TRUTH. Now we await the Infamous In-Flight PAPAL Press Conference. Will Church History be made? I was told by a priest (not in my parish) that this scandal will fade away with the next big thing in the world that consumes our interest. Also, Archbishop Vigano went after Pope Francis because Pope Francis got rid of him. I was so taken aback I was speechless. Just more of the same rhetoric that assumes we are idiots. STEVE RAY HERE: In times past I would have said the same, that it would blow over. But with the implication that it is the Pope who is at the head of this and it’s a huge homosexual network and huge American prelates are involved, I don’t think it’s going to go away this time. The laity are angry and this will stay alive until some heads roll. I may be wrong, but I don’t think so. Previous post: Why Visit Mexico? Why Visit Guadalupe? Is it Safe? Join us! Next post: Really? The Pope has more important things to do ?!? !